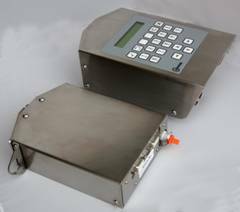 The i100 large character ink jet printer is an entry-level ink jet printer for coding time, date, shelf-life, batch and traceability information on most production lines. Stop Press. All Codeology ink jets are now available with Arabic fonts. The i100 can print one or two lines of print in any combination of one line only, two lines on one side of your product, or two single lines one on each side of your product. Needing no air supply (it needs only mains electricity) the i100 can be installed in minutes. An internal low-pressure air pump supplies all the necessary air which removes safety issues associated with fluid containers pressurised from mains air and means it is impossible to burst ink containers by over-pressuring them. Single line or twin-line low-profile print heads allow the heads to access the products even when mounted inside case tapers or machinery. Our smallest print head is less than 25mm high yet can still print a 20mm high character. Operating stand-alone, the printer can be controlled from a keypad or remotely via RS232 or Ethernet from a PC using iText software. IText software also allows factory automation systems to access the print count and production information. The keypad can be either remote and removable for security of operation, or incorporated into one of the print head covers for ease of use. If used remotely, one keypad can be shared amongst all of your printers. When built into the print head cover, one keypad can control print on both sides of your product. Operation of the keypad is simple. With today's multi-ethnic workforces from all parts of the world it is by no means certain what language the operators will know, so a simple Tick and Cross menu system is used to enable easy training and understanding. Editing messages is carried out in exactly the same way as texting on a mobile phone, allowing a small number of keys to call up the entire alphabet with ease so ope rator training takes literally minutes. Password protection of the integral dust-proof keypad is available at the press of a button, so you can enable operators to select the print message but only supervisors can alter them. The whole system has been designed from the ground up for ease of maintenance, ease of use and high reliability. It has been designed by a team that are not just designers but have worked with customers installing, maintaining and repairing coding and marking equipment for many years. Engineers have remarked on the thought that has gone into the design. Inside the cabinet, all the electronics is modular so it only takes a few minutes to replace any part. A lot of thought has gone into the design, for example the base unit that integrates the main control board, power supply, air pump and ink system has no screws into the back or bottom faces, so no matter where it is mounted all component fixing points are readily accessible. As with all Codeology equipment, stainless steel is used throughout to eliminate corrosion, maintain electrical and shielding integrity throughout the life of the machine and to provide a robust shell against the rigours of daily operation. All of our ink jet printers are available with either environmentally-friendly water based inks for printing on cardboard or timber, or solvent inks for printing on concrete, bricks and other non-porous substrates. Ink is supplied in 5 litre containers for maximum up-time and ease of ink changeover.